Pieta in the Toilet is the oddest-titled film in the Japan Foundation Touring Film Programme, now running in selected cinemas through February and March. No, it’s not a gross-out comedy; instead, it’s a very human drama about an extremely sombre topic, but shot through with humour and low-key spirituality. While Pieta’s not based on an anime or manga, it is connected to the work of “God of Manga” Osamu Tezuka; to Your Name; and to When Marnie was There. The film is the story of Hiroshi, 28 years old, who discovers he has severe stomach cancer. There is hospital treatment that can slow its spread, but little prospect of much else. The film depicts what Hiroshi goes through after this news. Much of this, of course, is grim. He’s not given to tears or hysterics, but the film depicts his loss of dignity (he has a sudden attack of diarrhoea while he’s trying to return to his old job as a window cleaner), and any purpose in a life seemingly cut short. Eventually, though, Hiroshi can’t help but be influenced by the new people around him, mostly cancer patients like himself. There’s a jovially perverted old man, Yokota, whose behaviour is comically (and sometimes not so comically) gross, but who proves to be a good friend. There’s a cheery little boy, Takuto, who loves colouring in drawings of big robots. At first Hiroshi shuns him, but eventually is moved to sketch pictures for the lad – we already know he was a gifted artist who seemed indifferent to his talent. He also befriends Takuto’s gracious mother – Rie Miyazawa, who was excellent in such films as Twilight Samurai and Tony Takitani. And then there’s a teenage schoolgirl, Mai. They first become acquainted by accident – Hiroshi is asked to bring a relative to his medical diagnosis, spots Mai in the hospital, and randomly pays her to impersonate his non-existent little sister. Later, Hiroshi is so bored with hospital life that he contacts her again; for reasons we’re left to guess, she meets with him. The scenes between them are often uncomfortable – she accuses him of having sexual motives in contacting her, while Hiroshi just wants someone to hang with who’s not a reminder of his cancer. At a Q&A with Pieta’s writer-director Daishi Matsunaga at London’s ICA, it was mentioned that Pieta was promoted in Japan as a romance between Mai and Hiroshi. “The advertising team decided that more people would come if Pieta was sold as a love story,” Matsunaga said. This was false advertising, although the relationship between Mai and Hiroshi is one of the more important, and increasingly emotional, strands in the film. Mai is played by Hana Sugisaki; it’s startling to learn she voiced the perky little girl Sayaka in When Marnie Was There only a year earlier! This April, she takes a lead role in a new film in Japan: Blade of the Immortal, a live-action version of Hiroaki Samura’s samurai manga, directed by the one and only Takashi Miike. It’s the actor playing Hiroshi who may be the biggest surprise to viewers. It’s Yojiro Noda, who’s best-known as the lead vocalist, guitarist and songwriter for a band called Radwimps. Yes, that Radwimps, whose music dominated last year’s blockbuster anime smash Your Name. Noda’s performance is convincing, unshowy and generous; there’s no sense he’s a “star,” more often being the rather muted centre of the film’s cast. 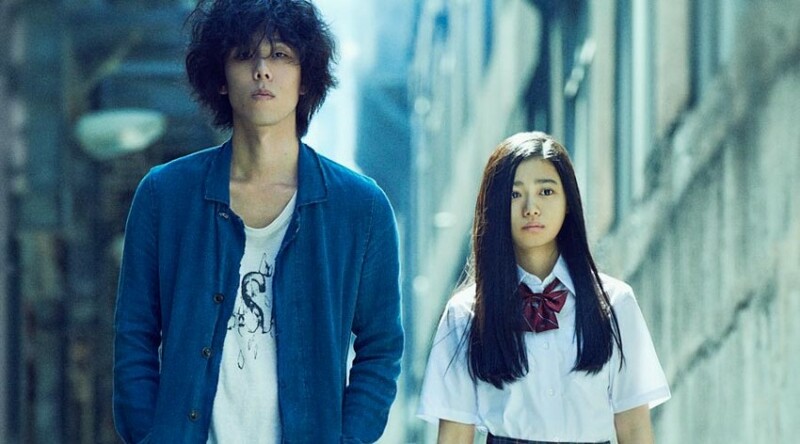 Admittedly, a Radwimps song plays out the end credits, but it’s no peppy anthem like “Zen Zen Zense”. Some very different music also figures in Pieta. In two scenes, near the beginning and end of the film, Hiroshi hums a tune most viewers will know as “Land of Hope and Glory,” or more properly part of “Pomp and Circumstance March 1”, by British composer Edward Elgar. In Britain, the tune has a patriotic reputation, and became somewhat notorious as a fixture of Last Night of the Proms, although the tune apparently has different connotations in Japan. Andrew Osmond is the author of 100 Animated Feature Films. Pieta in the Toilet is screening as part of this year’s Japan Foundation movie tour.